On November 29th, the Third Region-based Conference of National and Public Universities was held at the third floor conference hall of the Main Building of SeoulTech. (President Kim Jong Ho). The Region-based Conference of National and Public Universities promotes the growth of universities through cooperation among member institutes. The conference additionally aims to establish a forum for dialogue in which institutes can exchange constructive opinions on issues commonly faced by universities. Attending the conference were 16 presidents of 19 universities and the Secretary-General of the Korea University Education Council. Under the chairmanship of President Kwon Tae-hwan of Andong University, the conference discussed pending issues. 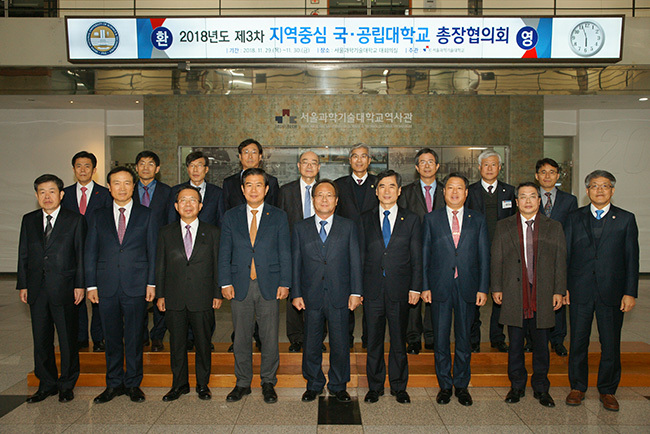 In addition, President Kim Nam-kyung of GyeongnamTech was elected the next chairman to lead the 2019 conference.